I'm a volunteer guy. Sometimes people give me a weird look at some of the events that I choose to volunteer. 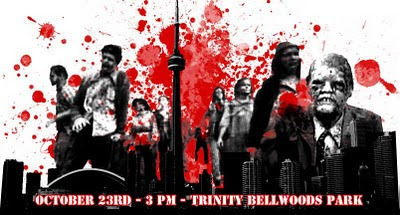 This time the weird looks came when I told people I would be volunteering for the 2010 Toronto Zombie Walk. I love Halloween. It's my favourite holiday and I love everything about it, though I did not expect what I would find on Saturday. Thousands upon thousands of zombies (like there were zombies EVERYWHERE!) were coming through the word-works to get a complimentary toe-tag and participate in the parade. I worked at the registration table since like 10:30 a.m. and things surely started off slow because the opening ceremony wouldn't start till 3 p.m. Once things began to get closer to the ceremony, zombies by the bus loads were making their way through the park to get registered for the event. The other volunteers and I at the Dundas location were frantically trying to register as many people as we could and get them notified in the statistics. Suffice it to say that at 4:35 p.m. we had to shut down the registration booth. The walk had to begin from Trinity Bellwoods Park and make their way to Christie Pitts. 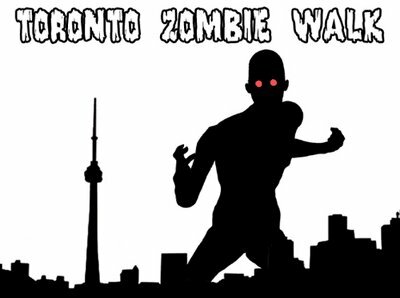 We didn't even finish registering all the zombies for the walk, we had to usher them into the pitt and tell them to commence the walk. I was so tired after those 7 hours that I choose not to join in for the big festivities at Christie Pitts. I will say that it was hilarious seeing all the original costumes that people choose to dress up as like Alice in Wonderland, Marie Antoinette, and someone came as Jesus with an actual life-size cross. The weather was really gloomy which was a plus for the ambiance but it started to rain and I felt so bad for the makeup artist who spent 7 hours straight helping people put on their make up.